Is a Laser a Dog or a Cat Toy? We have a Cairn Terrier who likes to chase all sorts of things that dart around. By his breed he should be fascinated and want to catch mice, gopher and rats. We recently bought our cat a laser to play with. It has turned out that that our dog loves it as much as the cat. I imagine some day that the dog and cat will smash heads one day when they both attempt to capture the light. It almost makes me laugh to imagine them like two stooges hitting heads and falling back stunned. Hopefully I will have a camera handy when it happens. I have a friend who is a tireless pet lover who puts an unimaginable amount of effort into Spay Neuter Awareness and Clinics. Just last Saturday Ms. L was the lead volunteer in pulling together a Spay Neuter Clinic in here in southwestern Montana. She managed to fill the schedule completely with 90 animals and was distressed that she had to turn 35 cats away because they could not handle any more. You may think that this is nice but it will drop off, but she has been at this now for several years. Hosting multiple clinics a year. This is the second clinic already this year. For some reason the need for this service never seems to taper off. I often wonder how it can go on like this, but sadly it does. Ms. L is a master recruiter of volunteers. Except for the vets in the spay neuter clinic is staff by 100% volunteers. Clinics are often held in school gyms and empty buildings. 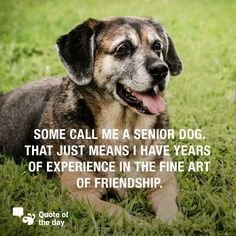 Experienced volunteers are often the vet assistants, but it takes so much effort by tons of people from check-in the minute the pet walks in the door until the last one is returned to its owner at the end of the day. Ms L. has no shame she will ask everyone for help. She knows many folks say yes to be there as a volunteer and then fail to show up because something better came along. She is always looking for a volunteer and there is always plenty to do when you show up. Ms. L is an educator. She will talk with anyone about the value of spay neuter. She has gone to county commissioner meetings, met with mayors and representatives ensuring they understand the benefit of supporting spay neuter efforts in their area. She knows that excess pets is a problem not just in her area or county, but the neighboring counties and national as well. She will go anywhere to talk about the cause. I have see her use every avenue to get others to understand the value of spay neuter. Look for her on radio, Facebook, and any where else that will let her in to share the message. Ms. L is not afraid to finish up any encounter with an ask….ask for your help. You decide how you wish to help, but she wants you to help. There are many ways to help. One of them is economic . It costs to host a Spay Neuter clinic. They hate to turn anyone away because they can not afford it. You can donate to pay for the spay neuter of pets for those who can not afford them. It also helps when they secure a grant to have your funds as they are often asked for an equal match to be raised on a local level. Ms. L has one more clinic to plan and hold yet this summer. That means there will be 270 less horny animals running around making more animals who will likely never all likely find a home. She is a animal lover and a hero. Those of you who follow this blog know I am a cat person, who brought home a shelter cat who hates me and loves my husband. This is the first cat we ever had that has NO use for me whatsoever. I have given her lots of time and tried so hard to win her over, but two years later it is no go. She will still walk out of a room when I enter. She will walk around me to get to my husband. I want someone to sit on my lap, purr and enjoy being petted. Now we have a dog, who is a companion animal to both my husband and me. He likes to be petted, but he is a terrier who doesn’t crave that “lap dog attention.” So he will sit for a bit on your lap for an ear rub, but he is soon back to sleeping on the floor. I have been watching the area shelters and thinking about a second cat. I am not a person who is attracted to kittens, I love the adult cats who suddenly find themselves booted out. If you tell me the owner died or went to a facility my hear screams for that cat. 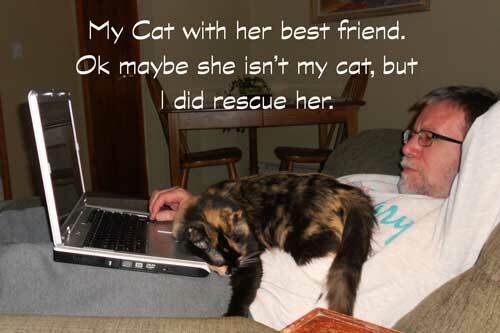 I know one has be careful when considering an adult or senior cat. I am the person that a shelter loves to see, because I don’t care about the “babies.” What I do know about adult cats is old habits are not likely to go away. 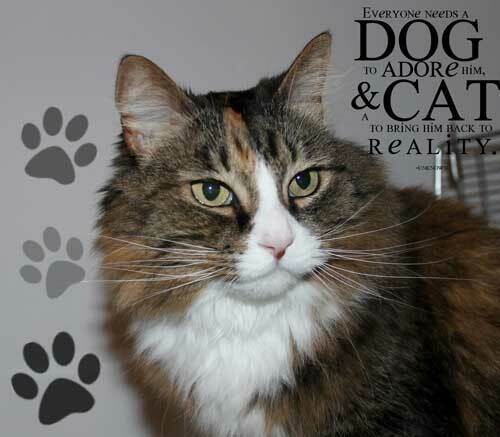 Life has already been hard for adult cats in a shelter setting and telling them they would be joining a sassy cat and a terrier could be just too much to ask. Friday I stopped by the shelter to look at the cats they had on hand. I sat in the cat rooms talking to the cats, hoping to make a connection. For some reason my cat karma is dead. Given the option of me, the kid doing community service sulking on a bench checking their smart phone or just hanging out alone I was the last option. No one came up and snuggled with me, though a few were interested in the kid, who was more interested in their phone. Any cat who I disturbed to pet and chat with acted like I was going to tell them their number was up. No cat wanted to hang out with me. I left without a cat. My time to have a cat of my own was not yet to be.